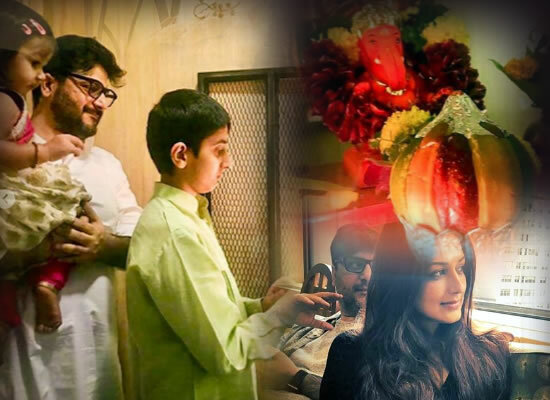 Sonali Bendre's emotional post as she misses Ganpati festivities back home! Mumbaikars always give a warm welcome to their favourite Ganesha as the 11-days festivities of Ganesh Chaturthi begins. From Shilpa Shetty to Arpita Khan Sharma, everyone in Bollywood has been sharing an inside glimpse of the decorations and festivities pomp on their social media pages. Sonali Bendre, who is presently in New York battling cancer, posted a heart yearning post on Instagram amidst this. Presently, Sonali is in New York. But her husband Goldie Behl and son Ranveer returned to Mumbai for the festival. In her post, Sonali posted a photo of her family doing the annual Ganesh pooja and expressed that she is missing being there with her family during the festival as it is one very close to her heart but however, she feels blessed. The emotional post was met with a lot of encouraging comments from admirers who have been praying for the actress' fast recovery. Her post read as, "Ganesh Chaturthi has always been very, very close to my heart. Missing the celebrations back home, but still feeling blessed. Have a happy one, filled with blessings, love, and joy." Sonali was diagnosed with cancer in July this year.